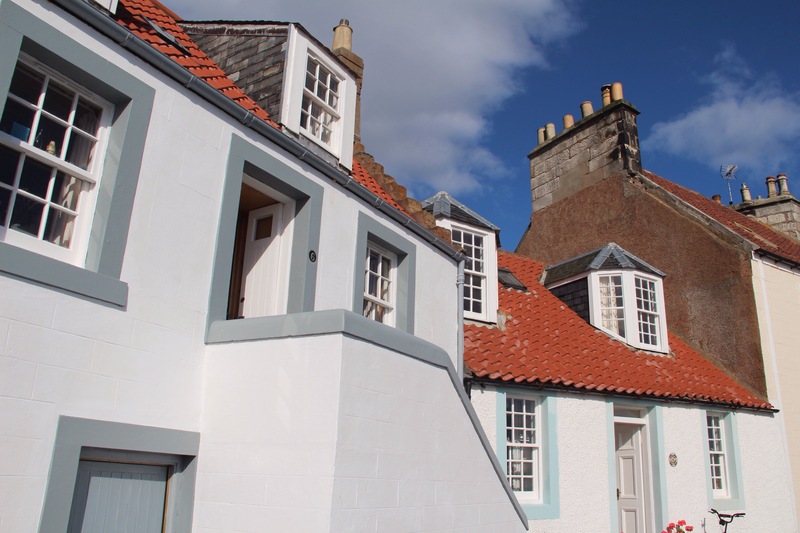 There’s a beautifully vibrant wee town, tucked away in the East Neuk of Fife, which has reinvented itself many times over the years. It’s name, Pittenweem, is a mix of Pictish and Scottish Gaelic words which mean The Land of the Caves. (Pit- Pictish for place or piece of land) (na h-Uaimh – Gaelic for of the caves). 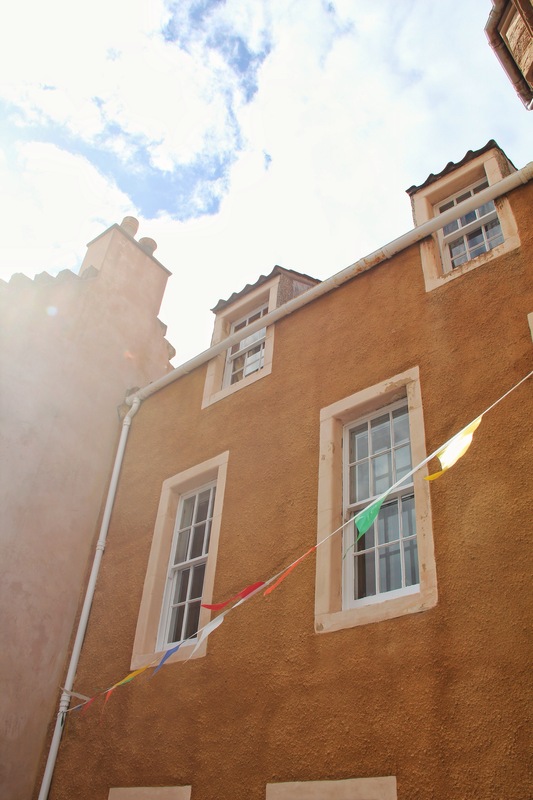 Currently famous as the yearly venue for the renowned Pittenweem Arts Festival, it plays host to over 100 artists over a 2 week period in August, and the venues for displaying and selling work are unusual to say the least. When I visited last summer it seemed as though every available inch of free space within the town was displaying something, and that included a lot of private houses. The doors are flung open and venue numbers are posted all around the town inviting crowds of art lovers to come in and take a look. Most of the houses host the work of just one artist, and stepping through the old wooden doors you are treated to one surprising exhibition after another. Often hosted by the artist themselves, most of whom are delighted to discuss their work and techniques, there’s a lot to take in and be inspired by, and after a while I was drawn back outside towards the simple beauty of the historic whitewashed and burnt umber houses and their red pan tile roofs. This costal town washed by the North Sea was once a bustling herring port, and the red tiles were used as ballast in the holds of empty ships from the Low Countries (Belgium and Netherlands), who came here to load up with the ‘silver darlings’ or herring. The crow stepped gable ends of the buildings ( called corbie-steppit in lowland Scots) were another influence from the Low Countries, which gives this vibrant town its distinctive and pretty look. Decked out with fluttering bunting and washed in that soft vibrant light which bounces off the sea and back around the historic painted buildings, it is the perfect venue for the yearly exhibition. Almost a work of art itself, there are many delightful little surprises waiting to be discovered up and down the steep cobbled streets and wynds which thread up and down the hill from the harbour. Hidden away in a tiny steep lane is St Fillans Cave, once home to a Celtic monk and later an Augustinian monastery. It is thought to be the origins of the first settlement on the site, although I’m certain our hunter gatherer ancestors would have known of the cave and made use of it and it’s fresh water spring. Back down at the sea front makeshift tea and coffee venues offer a space to sit and watch the waves rolling in and to chat about the artistic merits of everything on display. This year (2016) the festival runs from Sat Aug 6th – Aug 14th and you can find out more here. Find more vibrant posts to cheer you up on a dull winters day here at the WP weekly photo challenge. This entry was posted in art, travel, weekly photo challenge and tagged Arts Festival, festival, Fife, historic, history, Pittenweem, port, postaday, scotland, travel, what to do. Bookmark the permalink. Looks like a beautiful seaside town. Love the photos and your story. Hi Seonaid – I passed your post on to our local arts council rep who organizes a similar artists’ event in our county. Thanks for the inspiration. My pleasure, it’s great to get inspiration from other events, and the galleries in houses is such a great idea 😊Hope the event in your area goes just as well! LOOOOOOVE the view from inside!! Great tones and lovely composition. Thanks for the tour. There is something lovely about the view out of a window…. True. But it kicks it up a notch when it’s that view out of that window. What a charming and colourful town! It brimming with character and history…and of course artists! That sounds like such a wonderful town. I love the art galleries that pop up in people’s houses just for the festival. What a brilliant idea. I would love to see that idea catching across the villages of the world. It makes the whole atmosphere very intimate and so different, and I loved being able to chat to the artists about their work and their techniques….there were many wonderful inspiring characters to encounter. Every shop also became a venue, and lots of the outside space displayed sculptures and very funny tongue in cheek themed recycled bicycle displays! You really did know what you might encounter around the next corner. Such descriptive paragraphs as well as the pictures. The inside looking outside picture was just beautiful. 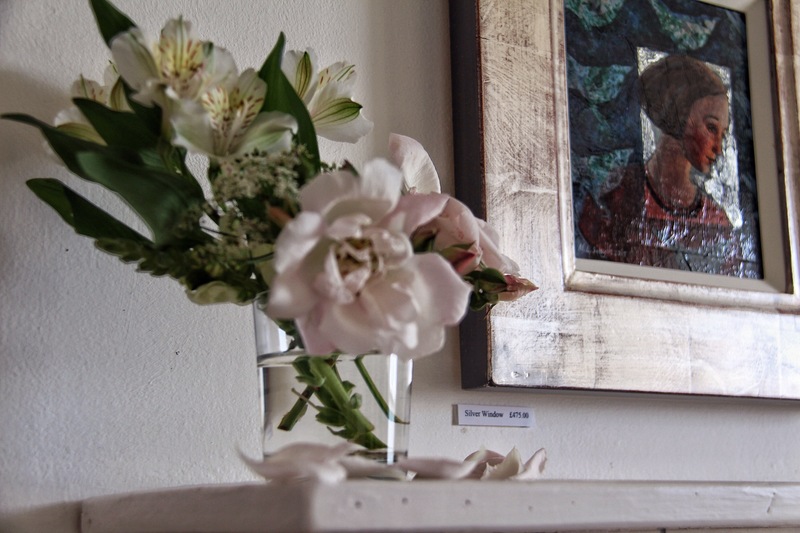 I love the idea of displaying art in homes and other venues as well as outside. More, please, of such wonderful towns. It really was a wonderfully intimate atmosphere, a special festival! 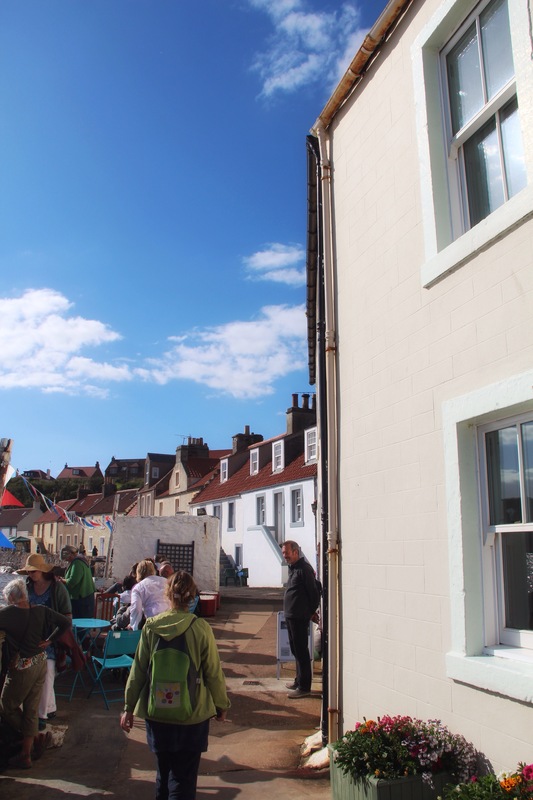 Great background information on Pittenweem and your photos are really special; there are few things I love more than participating in a community art festival. Couldn’t agree more Charlie, and this one is particularly enjoyable and friendly! This corner of Fife looked very appealing but, alas, our stay locations weren’t close enough for a visit. I’d love to visit during the art festival. What a charming town. Did you display your art here? I work and stay in Edinburgh and even though your only across the forth I have never actually been to Pittenweem. Looks lovely and I reckon I will take a drive over this August to see the Arts Festival for myself, sounds very intriguing! Thanks for the enjoyable read Seonaid. One other thing?… What camera did you use for these pics? Hi Ross, it’s definitely worth a visit, it’s busy but lots of fun and very inspiring! I had heard about it for years before I finally ventured over for a visit, and will definitely be back. I think it would a nice place to visit even when the festival isn’t on! I do wish I could get Simon to travel around the Highlands and Islands with me! He just won’t do cold. I want to star in your neck of the woods though and go back to Perth and Loch Tay. My cousin is studying in Edinburgh so I may just rock up at hers one day 😉 My aunt is still just north of Stirling but I know her house isn’t particularly visitor friendly! Do you ever venture up into the Cairngorms? Never been and always wanted to! Such a truly wild landscape. Very ‘different’ in many ways. Of course, I immediately homed in on the cave and did a quick virtual exploration. Only a monk could really feel at home there! It is, and I love the story of the cave…..I plan to visit when it’s a little quieter and ask for the key for the cave, which is apparently held by a coffee shop! The whole of the coastline of Scotland is peppered with caves used by Culdee monks who liked to retreat into nature and contemplate the universe. Usually there’s a well too, for water, which then of course became a holy well! I have discovered with further research that there are a few respectably large cave systems in Scotland, which I would love to clamber through! There are, and one of the most fascinating….to me atleast…is the recently discovered, or should I say re-discovered, High Pasture Cave on the Isle of Skye. A very ancient place of worship…complete with water of course! Lovely photos and info, Seonaid. It really does sound like a very vibrant place indeed. 🙂 I especially love the window photo. 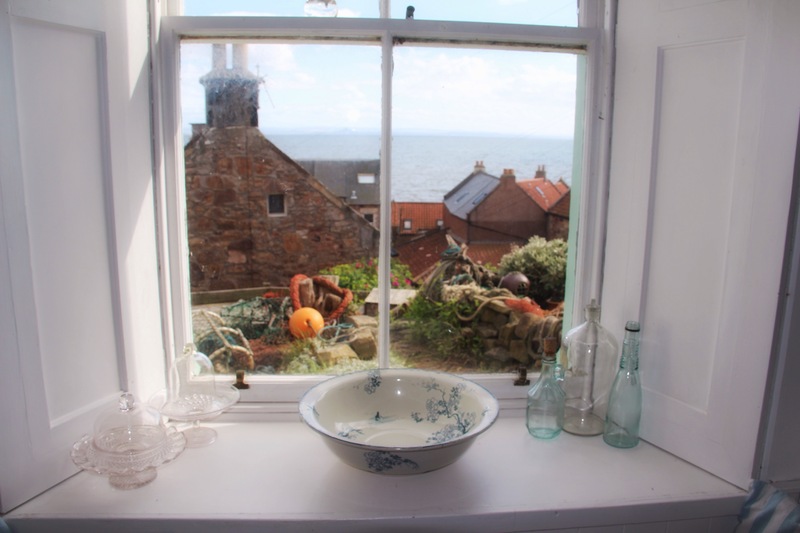 I just loved the view out of the houses as we went around visiting, and this one even had a lovely tasteful display in the window! I tried lots of different angles, so I’m delighted to hear you liked the results! One of my favourite places on earth, never mind Scotland! We are fortunate enough to occasionally housesit and just have a staycation in a gorgeous house on Westshore whose owners now live in Switzerland. Andrew’s Dad until last year exhibit from that house during the Arts Festival – such the best time to go through and see Pittenweem at its sparkling, flower-bedecked best. Love, love love this tiny but perfectly formed place. Also, their fish and chip shop is just as good as Anstruther, but much cheaper! Fantastic elongated pics of Pitenweem, I had a friend who came there! Oh I’ll check the photo formatting…are you viewing on a tablet, pc or phone? Thank you….having a conversation with WP about it…so fingers crossed! Delighted you came back and saw them in their full unadulterated glory!